It is thought that the Lorne sausage, which also goes by the names of square sausage, sliced sausage or sausage slice, was an invention of the Scottish comedian Tommy Lorne who lived from 1890 and died in 1935. He was born in Kirkintilloch near Glasgow. His birth name was Hugh Gallagher Corcoran. Tommy Lorne performed in many Scottish theatres and often performed in Glasgow and Edinburgh and was much in demand for pantomime. In his own acts he would apply white make-up and wear a short kilt, a glengarry, boots that were far too big for him and a jacket that was short. He spoke in an hilarious high pitched voice. Tommy Lorne was famed for several catchphrases such as "In the name of the wee man" and "Ah'll get ye", and "If Ah don't get you the coos'll get ye!" Other names for Lorne Sausage can be found in Taste Ye Back: Great Scots and the Food That Made Them which includes Butcher's Slice, Square Beef Sausage and Square Slice. It is thought that Lorne sausages were named after Tommy Lorne because of another of his famous catchphrase: "sausages are the boys" - he loved his sausages! He often ate a sausage sandwich between his acts. It has even been suggested that not only were Lorne sausages named after Tommy Lorne and to give people an easy to make sausage sandwich, but that Tommy Lorne was the inventor of the Lorne sausage. 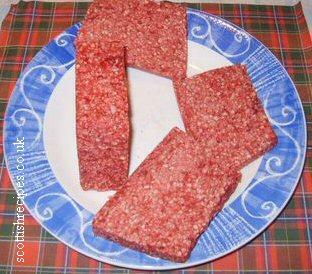 Whoever did come up with the original recipe for Lorne sausage is owed a debt of gratitude to many Scots. The shape and size is perfect to fit between two slices of bread to make the perfect sausage piece. Rene La Sagne in the book The Complete Book of Mince wonders if the shape of the lorne sausage is such so that it makes more efficient use of the grill and frying pan. The book A Cook's Tour of Scotland by Sue Lawrence has a lorne sausage casserole recipe. 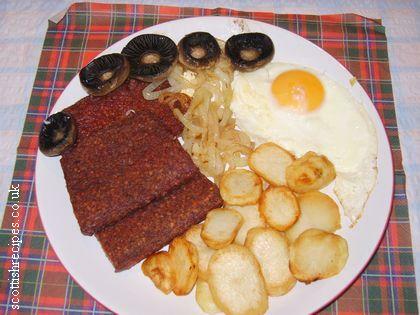 There are also examples of how some Scottish people eat their Lorne sausage such as putting the Lorne sausage with an egg between a morning roll, whilst some Scots add a tattie scone. There is a traditional Scottish Loren Sausage recipe in the Maw Broon's Cookbook which uses minced beef, minced pork, eggs, breadcrumbs, seasoning and spices such as nutmeg and coriander seed. Buy Maw Broon's Cookbook at a discounted price and with free delivery available. 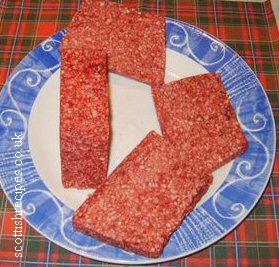 A common misconception is that the Lorne sausage comes from the area of the Firth of Lorne. The Firth of Lorne can be found in the West Coast of Scotland at Argyll and Bute. This 25km large body of water lies between the Isle of Mull and the Isles of Kerrera, Seil and Luing (the Slate Islands). It is as wide as 10km in parts. The Danger Of Lorne Sausage Blocks! In June 2006 the actor Alex Norton, star of Taggart (DCI Matt Burke) and Pirates of the Caribbean: Dead Man's Chest (Captain Bellamy) was stopped by security guards at Glasgow Airport who mistook his kilogram of Lorne sausage for the high explosive Semtex! He was on his way to London and taking the square sausage slab to blow up the tummy of his Scottish friend who wanted a taste of Scotland for his breakfast! It is recommended that either or a mixture of minced beef and minced pork is used. The ideal square sausage slice should have at least a 20% fat content - great for blocking the arteries! Health conscious eaters of Lorne sausage may want to alter this percentage for their recipe! 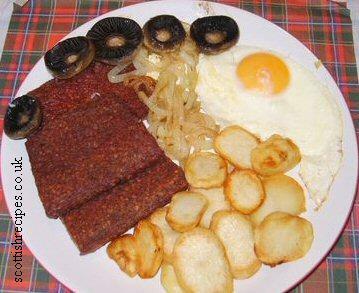 Traditional cooks would argue that the high percentage animal fats are needed to stop the square sausage becoming too dry. The square sausage slice is bulked up in equal proportion with rusk which is traditionally stale breadcrumbs. Crushed bones have been used in some very old recipes but aren't recommended! Modern chefs will use fine bread crumbs in their recipes. The unique taste of Lorne sausage comes from the seasoning. Many butchers and chefs have their unique recipes but common seasoning ingredients include salt and pepper with some nutmeg and coriander. To make the square sausage add the ingredients together into a large bowl adding a cup of water if the sausage mixture gets too dry. Form into a square and either leave as one big block or cut individual slices or smaller blocks. 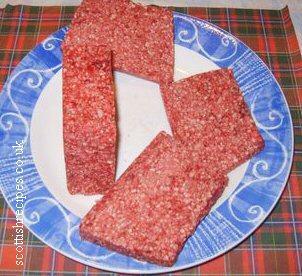 Most square sausage slice will be about 10mm thick and 90 mm in length. This can then be stored in the fridge or freezer. 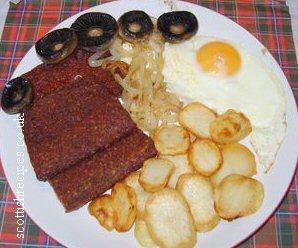 The square sausage is then defrosted and fried in oil until browned. Lorne sausage may not be the healthiest type of food to eat - but it tastes great. It is best eaten as a sausage piece between two pieces of lightly buttered bread. It is also great at breakfast or any other time with baked beans, fried onions and mushrooms, baked beans, grilled tomatoes, fried eggs, bacon, black pudding, potato scones and hash browns. A bit of toast should help anyone still hungry after their Lorne square sausage slice breakfast!